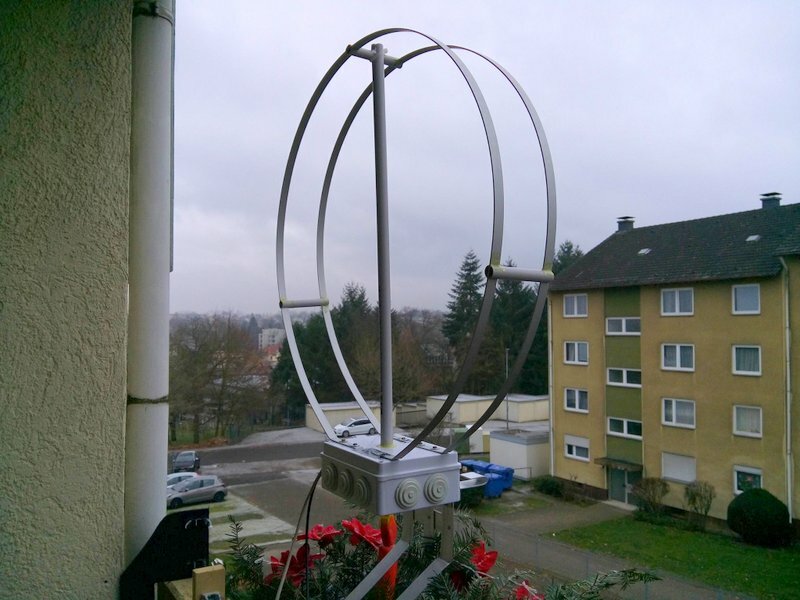 Many thanks to SWLing Post contributor, Klaus Boecker, who follows up after our recent post showcasing his homebrew magnetic loop antenna. One of the cool things about Klaus’ antenna is that he can easily position it vertically (see above), or fold it over into a horizontal position (see below). While one would think Klaus would get optimal performance from his loop while vertically-oriented, it’s not always the case. Klaus has discovered that on some frequencies, placing the antenna in the horizontal position lowers the noise level and increases the target signal’s strength. That’s a pretty amazing difference, Klaus! I’m no antenna expert, but perhaps what’s happening is you’re eliminating noise that is polarized in the plane of your antenna, thus the signal “pops out” much better when oriented horizontally? I’m curious if any readers can explain this. I know very little about loop antennas–especially small loops since so much of their surroundings affect their performance. This entry was posted in Antennas, Ham Radio, News, Shortwave Radio, Videos and tagged Klaus Boecker, Mag Loop Antennas, Magnetic Loop Antennas, Urban Shortwave Antennas on January 9, 2017 by Thomas. I later found out that the source of interference on that frequency was (is!) indeed directly below me, so I would agree with the noise polarisation hypothesis. There are MANY references to mag loops these days as they have become quite popular for transmitting as well as the traditional reception. I recently bought a Chameleon F-Loop+ that I hope to put in service shortly (though admittedly, if I had the tools, I could have constructed a much better one for all that $$$). Basically, there are a few things that could be going on–likely a combination. 1. Polarization, as mentioned by Dood above: it’s one reason why TV and some FM broadcast stations use horizontal, as it’s less affected by noise. A second is that it travels further in V/UHF due to better knife-edge diffraction and other factors. (Very different from LW/MW/AM ground waves.) However, some places may have more horizontal polarized wiring (like the motel I work at) than others, so YMMV. 3. Steve states above that, except for vertical mounting very near the ground (which, contrary to pretty much all others, appears to be very good thing for this antenna, especially if the ground is good), the polarization is very “dirty” (my word), meaning you get both. Thus you’ll still have both even if you mount horizontal. The difference is that now your null is pointed straight up and down. 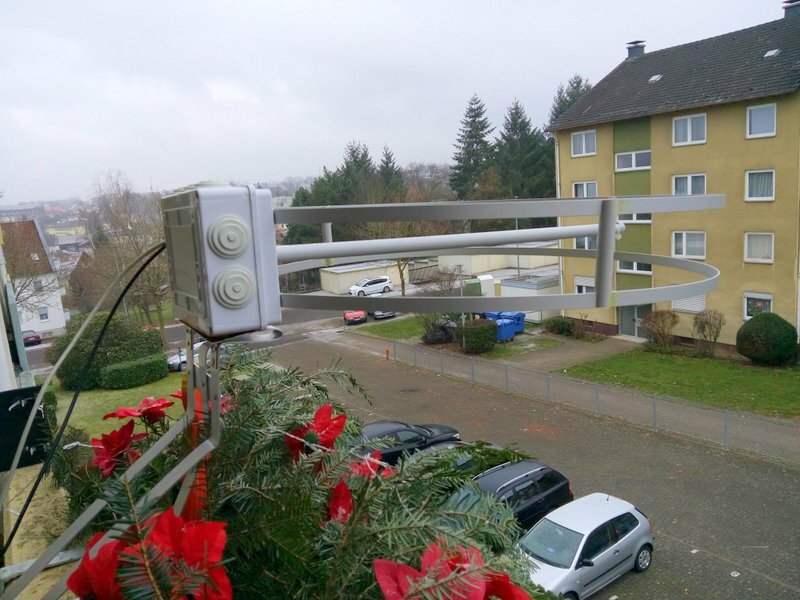 Klaus is on an upper floor so if the noise is directly below the antenna, going horizontal would kill it dead, especially if not radiating back into the building wiring. This is no different than nulling using the loop-stick in your AM/MW/LW radio, but, if built correctly, the nulls should be sharper. Lots of QRM is vertically polarized indeed and there can be a significant decrease in noise level by going H. There is a catch however, a horizontal loop needs to be mounted high above ground. Most made-made noises are vertical in polarization, so by going horizontal you can attenuate those noises as much as 20dB. I couldn’t see the VID, but is that a Kenwood R1000? Those are fun receivers. My question — can he build me that antenna!